I apologize for the number of reviews in this update, by the way. I have fallen behind. Though the Festival is nearing completion, Ruth and I have plenty more coverage to come. Stay tuned! Meanwhile, Away From the Festival . . .
It’s official: I like Duncan Jones. A lot. There are many great people participating in Movie Blogville, and I am fortunate to live in the same city as one of them. 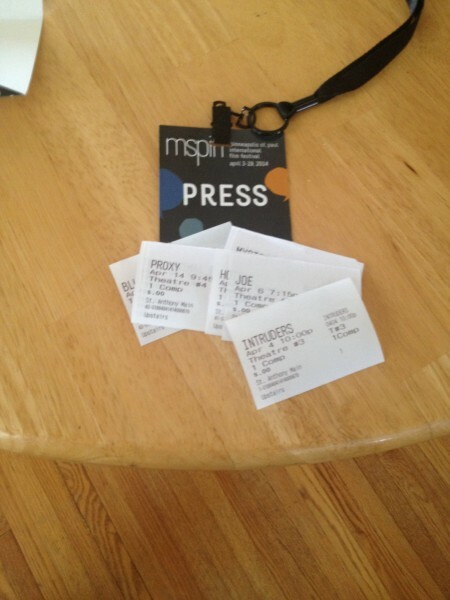 Courtesy of Ruth, I will be covering The Minneapolis-St. Paul International Film Festival for the next two weeks. On behalf of Flixchatter, where my reviews will first appear, I will see no less than a dozen of the festival’s offerings, including, but obviously not limited to, Joe (USA), Mystery Road (Australia) and The Double (UK). Which means I owe Ruth public and sincere acknowledgement. Ruth, you’re awesome! Thank you for securing the Press Badge and for making me part of the Flixchatter crew; I am excited to see Intruders (South Korea) later tonight, and all of the other movies that come after it. Thank you again!